Mix jam with your favorite hot cereal. Microwave jam or jelly until melted and pour over pancakes, waffles or French toast. Combine 2 parts low-fat sour cream and 1 part jam or jelly. Use as a dressing for fruit salad. Add Apricot, Peach or Pineapple jam to cooked carrots or sweet potatoes before serving. Use Strawberry, Apricot or Cherry preserves as a baste or glaze for ham or Canadian bacon. 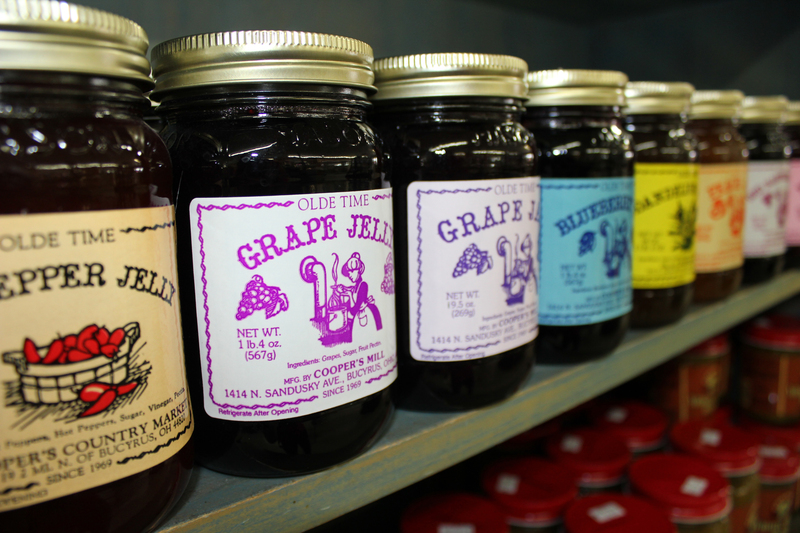 Jams and jellies can also be used as a glaze for beef, pork, turkey, chicken and fish. Suggestions: Currant or Quince jelly for beef; Pineapple, Apricot, Cherry or Peach for pork; Cherry, Red Raspberry, Peach, Apricot or Pineapple for poultry; Quince with hot mustard for fish. Fill varieties of squash with Apricot or Pineapple preserves before baking. Sweet and Sour sauce: Combine 1/2 cup jelly, 2 Tbsp. soy sauce, 1 Tbsp. Worcestershire sauce, and 1/2 cup wine vinegar. Simmer 5 minutes, stirring constantly. Barbecue sauce: Mix 1/4 cup Sweet Orange Marmalade, Apricot, Peach, Plum, or Pineapple Preserves with 1/2 cup chili sauce, and 2 Tbsp. steak sauce. Use preserves as a topping for ice cream, cakes (poundcake, sponge or angel food are good choices) and cheesecake. Preserves can also be used as a cake filling for a quick and easy dessert. Melt grape jelly, then dip seedless grapes into slightly cooled jelly. Roll dipped grapes in granulated sugar and use as a snack or as a garnish. Low-fat milkshake: Blend 1 cup low-fat frozen yogurt or ice milk with 1 cup skim milk and 1/4 cup preserves. Make your own fruit yogurt by stirring 1/3 cup of jam or preserves into a cup of plain yogurt. Sweeten a cup of hot tea with 1-2 tsp. of your favorite flavor jelly. Use as a sauce on fresh fruits or spoon into peach, pear or apricot halves. As a special ice cream treat, spread any flavor preserves or jam on two toasted waffles. Sandwich a scoop of vanilla ice cream in between. For a new flavor twist to brownies, add 1/2 cup of Cherry Preserves to brownie mix ingredients and bake according to package directions.